How can I do better in Maths? So how do we do that? How do we get better at Maths? First of all – and this is extremely important – stop telling yourself that you simply can’t do Maths, or that Maths is too difficult for you. We can all master Maths – we just need some strategies to get us there. Hey, I know what you are thinking now. You’re thinking: Ugh, here’s another know-it-all with another boring old list of yet more stuff to do when I’m already so busy. Well, let me stop you right there. This list is different. It is a tried and tested one, based on my own personal experiences both as a learner and as a teacher. Trust me. Pay attention to what is being taught in your Maths class. Don’t allow your thoughts to wander in class. Don’t allow your friends to draw your attention away from what the teacher is saying. In Maths, new concepts are being taught almost every day, and by tomorrow you will need whatever you are learning today. One class builds on another. Don’t miss a single Maths class, but if this is really inevitable, make sure to catch up on what was done in class. Ask a friend who understands the work or go ask the teacher. Don’t ever fall behind. Basic skills and understanding basic Maths concepts are essential. Don’t let this become an obstacle in your path towards improving your Maths scores. If you don’t know your multiplication tables, for example, go study them until you know them by heart. If you struggle to remember a certain important formula, write it down on a sheet of paper and put it up somewhere in your room where you will be able to see it every day. If you find that you missed something in a previous year which you now need in order to understand the new work, go back to that missing piece of information. Find that year’s textbook in a library or borrow it from a younger friend and then study that section of the work. You could also simply ask your teacher to explain these concepts to you. There might not be time for this during your Maths class, but perhaps your teacher could explain this to you during a free period, during break or after school. Don’t be afraid to ask questions in class. Chances are there are a bunch of other kids who also don’t know but are too shy to ask. If you are unsure of anything the teacher just said, ask. Don’t overthink it – just ask your question immediately. Did you know that asking questions when you don’t understand something is actually a skill? In fact, it is a skill you will need all through your life: in relationships, in your workplace, in financial situations, etc. If you don’t ask questions when you are unsure of something, you might end up making mistakes that could actually cost you quite a lot of money later on in life. Besides, your teacher should appreciate and respect your asking questions, because this will let him/her know that you care about the work and want to learn. Homework is an extremely important part of mastering Maths. By doing all of your homework, you get to practise what was done in class. This is a crucial part of mastering Maths. Don’t think that it is enough to simply understand the work the teacher taught in class. It’s not. By next week, you will have forgotten what was being said in class – unless you took the time to practise the work on your own. But don’t leave your homework until late at night – no one feels like doing Maths homework in the middle of the night! Do it as soon as you can, before you start getting tired. Everybody is different, and I believe in the saying “different strokes for different folks”, so try to find a time during your afternoon or evening that works best for you. For example, for some it might be a great idea to do their Maths homework directly after sports practice. After getting some exercise and fresh air, one’s brain is usually energised and ready to learn. Make it your mission to do every single Maths problem in your textbook in the course of the year. If your teacher asks you to do questions 1 to 4 only, go ahead and do all 12 questions in that exercise. You won’t regret this. This automatically means that you will be spending extra time on Maths. Find previous test and exam papers – these are great for doing revision before tests or exams. Even if you spend an extra 15 minutes on Maths every day, you will be rewarded in the end. The more time the better, of course, and it would be ideal to spend an extra hour on Maths every day, but I know this is not always possible. Set a time goal for every day of the week and stick to it. Also, don’t underestimate those 15 minutes before dinner, or the 10 minutes before you need to leave for school. You could be doing a Math problem or two in that time. Studying with a friend or study partner and learning from each other can be very rewarding, but just remember: In the exams you will be on your own. So don’t become too dependent on your friend to get the ball rolling for each and every Maths problem you two are working on. Sometimes you need to focus and struggle on your own for a while before asking someone else for help. Otherwise working together too frequently could actually work against you instead of helping you to improve your scores. If you regularly struggle with your homework and often still don’t understand concepts even after asking questions in class, consider taking extra Maths classes. Make sure to join a small group, where the tutor has enough time to explain concepts to you and where you will have enough time to work on Maths problems on your own as well. Most importantly, don’t hesitate to ask the tutor to explain anything you are unsure of. Ask again and again – until you really understand it. Then practise, practise and practise some more until you have really mastered that specific concept. 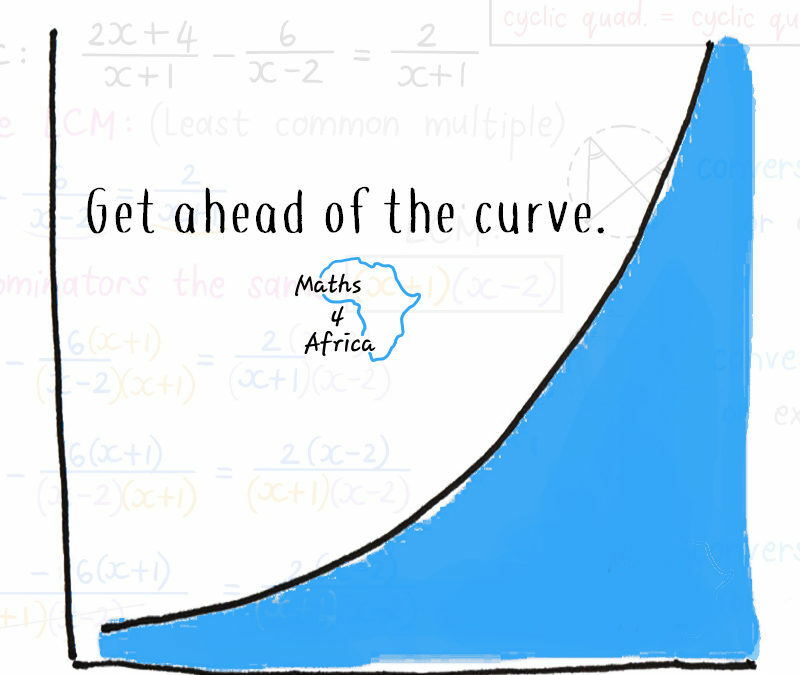 At this point, I should add that Maths 4 Africa has introduced a marvellous tool for understanding Maths: the Maths 4 Africa study guides (currently available for Grades 10, 11 and 12, and soon for Grades 8 and 9 as well). Learners who regularly use these study guides swear by them. They are these learners’ first port of call whenever they are unsure of anything. The books are colourful, they explain things in a simple manner, and they cover everything you need to know. Keep this study guide at arm’s length whenever you are doing Maths. And after finishing a specific chapter in class (as well as before writing a test or exams) go back to your Maths 4 Africa study guide and recap everything that was dealt with in that chapter. Last but not least, learn from the mistakes you made in your homework or in tests or exams. Don’t just leave them and move on. Study your mistakes and find out why you made them. By understanding why you made a certain mistake you will know how to avoid repeating this same mistake in the future. We’ll discuss exam situations and handling stress during exams another time. For now, focus on these strategies and start implementing them as soon as you can – today, if possible!